I’m posting a little fun frame I did yesterday. No special reason other than it was far too hot to be outside, so I sat in the basement and played with this. So what do you think? Designer papers from K & Company, Spellbinders Dies, Un- known graphic, stamps from Betsy Griffin and Hero Arts. I embossed the frame with Versa Fine White Chalk ink and white embossing powder. The graphic is Black and White I printed in on acetate and mounted it to designer paper to give it some color. Everything is mounted on foam type to give it a 3D affect. Hope you are staying cool, they are calling for 98 today, and so it’s back to the basement for me, thanks for stopping in. 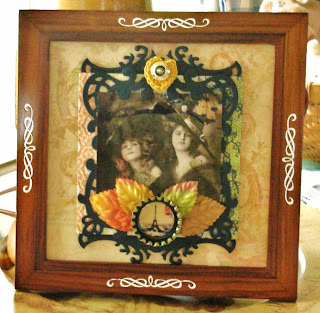 I’m off to play with “Planes and Trains”… New challenge at Gingersnaps..
Vada, what a great way to dress up a frame! Love how you framed the images! Beautiful design! Stay cool! Great frame redo Vada, love the bottle cap and leaves, very cool. At least I hope you are too.